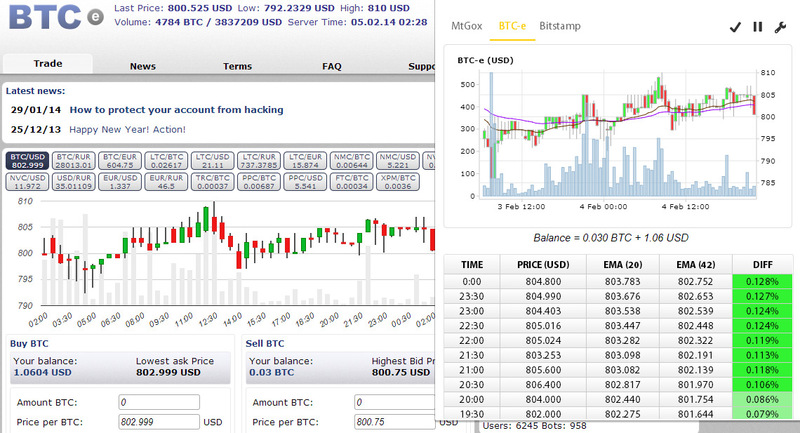 Our 7-day trial of the Butter Bot automated Bitcoin trading bot that supports BTC-e, MtGox and Bitstamp Bitcoin exchanges is now over. The last day we did not get any activity, so there was no change in the balance we’ve had in the two exchanges we tested with – BTC-e and MtGox. During the 7 days of testing at BTC-e and a few less on MtGox the bot has generated a only few trades, with minimum profit to minimum loss, though at the end we were just a bit ahead than with what we have started. The reason for that was however the fact that we started with the Bitcoin exchange rate higher than at the end of our test and after manually exchanging the USD we’ve had after the trial of the bot ended we finished with a bit more in Bitcoin balance than when we started. What we can say for sure that the Butterbot is very easy and user friendly to start trading with, you get decent recommended startup settings for trading on the different exchanges and you can quickly get the hang of it and optimize the trading settings. The backtesting feature that allows you to quickly test different trading settings against real data from the supported exchanges, so you don’t need to be a pro trader to be able to fine tune your trading strategy to get you better profit. We’ve seen that the bot is not making a lot of trades as it plays more on the safe side with the recommended settings, though you can make it trade more with a more aggressive settings with a higher risk. One important thing to note is that during our testing the exchange rate wasn’t moving up/down a lot, there was a more general downtrend going on all exchanges, so it was probably not the best time for testing how good will the Butterbot perform. Regardless, we’ve seen that even in not so good market situations you are not very likely to loose your money because the bot will start unreasonable trades, though with bad trading settings there is a chance that this may happen too – so test your trading strategies more often as some settings may work better at a time and not that good in a few days. So what is our final conclusion? The Butterbot automated Bitcoin trading robot is good and affordable, t is easy to be used by normal people that are into crypto currencies and that may have never traded Stocks or Forex and that is probably the best thing about it. You will of course need to read a bit about trading in order to be able to use the full potential of the bot. What you should not expect is high profitability in a very short time, the bot will probably perform well on the long run, so you should probably give it more time. than just 7 days. Another very good thing about this automated trading bot is that it has a free 7 day trial available for anyone willing to give it a try, like we did, before deciding to pay for it. There are other more expensive alternatives available that you have no chance of trying before you need to pay a significant amount of Bitcoin or cash, so you should be careful with these – we are going to be trying some of the alternatives as well soon. 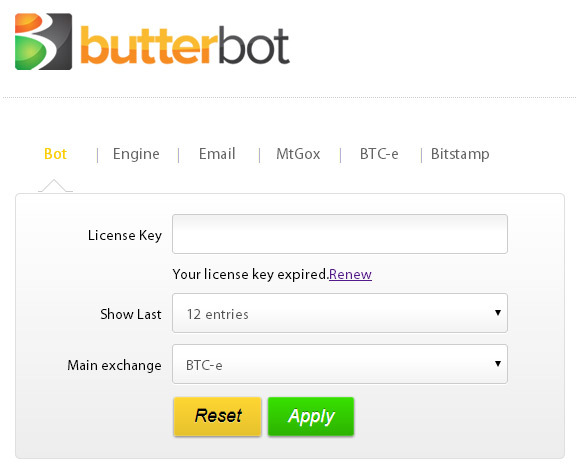 And now the most important question – are we going to continue using the Butterbot and purchase a license and subscription for it? While we were generally pleased with the ease of use, features and performance of the Butterbot we are going to give it a pass for now and also try some other alternatives, but we are going to get back to it probably sooner than later. The reason for that is that the author of the Butterbot is apparently extending the trading support to LTC (in beta), thus giving additional options for realizing profit or markets with higher volume than that of the BTC. It would be nice to also see other exchanges supporting more exchanges for alternative crypto currencies as well such as Cryptsy as that can really open up a lot of possibilities. What we are going to recommend to anyone interested in Butterbot and in general about automated crypto currency trading bots to give a try to Butterbot, you can have a free 7 days trial with no strings attached and then decide for yourself. The 6th day of our Butterbot automated Bitcoin trading bot testing has passed and it is time to see what has happened in the last 24 hours. On the BTC-e exchange we got a new trade, as a result we now have 24.77 USD balance so we are a bit short of the initial 25 USD that we started testing with. We’ve had a bit more in a previous trade, so we were actually making some profit, but at the moment we are at a short loss. Again not very active in trading, and this is what you should expect from this automated trading bot with the recommended or slightly optimized settings, though you might be able to make the bot trade faster with higher risk. The fourth day of testing Butterbot on the MtGox exchange produced no trades at all and our balance is still 37.37 USD, but the general trend on the exchange was down, so maybe tomorrow we are going to see some trades. Don’t forget that the current market state and the trades at the exchange are very important to how an automated bot may react and execute trades or not. We have one more day left of our trial period for testing the Butterbot automated Bitcoin trading bot, before making the final conclusion if we are going to purchase and continue to use it or not. So far we are not too happy with the results we are getting and we are already looking for other alternatives to try out next, but let us finish with the Butterbot testing first. The 5th day of our Butterbot automated Bitcoin trading bot has passed and it is time to see what has happened in the last 24 hours. 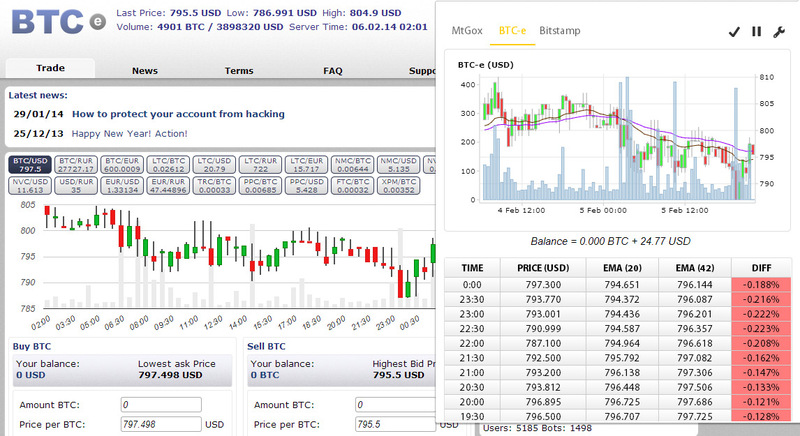 On the BTC-e exchange we got another trade, as a result we now have 0.03 BTC + 1.06 USD balance instead of just 25.2104 USD. It was again a slow day with nothing that significant happening on the market to give us some more trades. This is the third day since we also started testing the Butterbot on the MtGox exchange,however in the last 24 hours the market activity on MtGox wasn’t anything special either, so no trades were executed by the bot and our balance remains at 37.37 USD. With these stable markets it is hard to make cash from trades, especially if you are not very aggressive and trade with a high risk and this is not something we want to do. We are up for another 24 hours before the next report, however so far we are not very pleased with the results we are getting from the trading bot, though that does not mean that the bot is not good. We are nearing to our final conclusion at the end of the 7 day trial and for already a few days of trading and us getting familiar with the automated trading bot, the settings and the trading options we are still not that happy with the actual trading that it does so far and we are already looking into other alternatives to try next.